Your rabbit cages plans should allow your bunny to stand up straight on their hind legs, and provide enough room for a litter box and food bowls. With everything in your bunny’s cage, they should still have plenty of room to move about. Rabbits are active creatures and require exercise to maintain proper health. 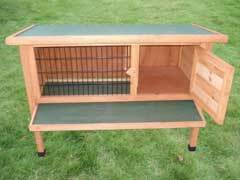 Outdoor rabbit hutches should take all these things into consideration, and include plenty of water for drinking. If you live in a warmer climate your rabbit will need to be kept cool, temperatures above 85 degrees can be lethal to rabbits. In freezing climates it is important to make sure their water doesn’t freeze, and they have hay or other material to snuggle into for insulation. Rabbit cages should also have proper flooring. Floors made up of metal grates allow easy cleaning, but they can damage a rabbit’s feet if there isn’t space covered for relief. Supplies for rabbit cages are fairly simple, food bowl, litter box, water bottle, and bedding. Bedding should be hay or other material that your rabbit can eat without causing them any harm. Because rabbit litter training is easy, it is best to do so to help keep the rabbit’s cage sanitary between cleanings. A ferret litter box designed to fit in corners work very well and take up less space than rectangular or squares boxes. Food and water bowls should be made of metal or ceramic, rabbits will chew plastic bowls. Chew toys should be included in the cage to give your rabbit something to do. Most important of all, though, is adequate space and water.